Guess who (or rather, what) thing came knocking on my door when I was about to set off to Sydney? A MEGA HUGE ' Pyramid Tea Bag' indeed! O.O"
I'm pretty sure majority of us (Singaporeans/ Malaysians) should have heard of this popular tea brand which I fondly remembered that my parents used to call Lipton as 'Ang Moh Teh' due to its rich brownish-red colour when dip into the hot water, and also how the English love to have their cup of tea' during mid afternoon. Infusion of Raspberries, Blackberries and Black current infused in the tea leaves! Distinct taste of Oranges, Limes, Grapefruits and Lemon infused in the tea leaves! Recommended for as an afternoon tea for a refreshing sensation! Perfect combination of Red current and light flavour of raspberries infused in the tea leaves! Suitable for anytime, any day! Even Papa Teo also couldn't resist to try the Ang Moh Teh! Check out the GOODNESS brewing out from the pyramid tea bag! The elegant, pyramid shaped tea bag liberates the best flavours by allowing the large tea leaves, flowers, herbs and real pieces of fruits optimum room to infuse for greater aroma, color and taste and an extraordinary taste experience! For tea lovers, this means that you can enjoy a refined tea drinking experience with the convenience of a teabag which also delivers the natural antioxidant power of the whole tea leaves!!! AWESOME! Sorry, no prizes for the correct guess! :P LOL!!! BUT... for my readers, I will share with you guys how to cool down on a hot afternoon with this deliciously smooth and refreshing sorbet! 1. 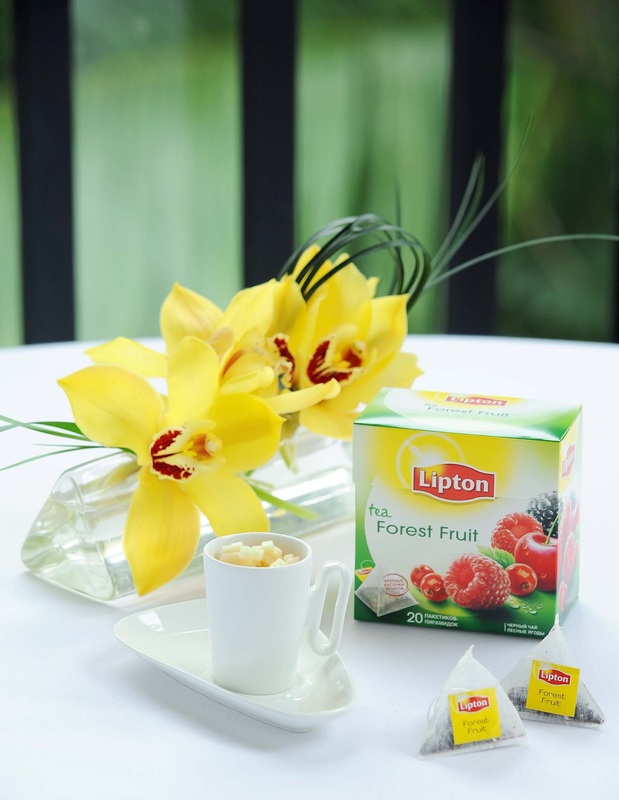 Infuse Lipton Pyramid Forest Fruit Teabags to 800 grams of cold water. Keep in chiller for 2 days for tea to deeply infuse. 2. Warm glucose syrup, lime juice, lemon zest, lemon juice and sugar in sauce pan in low heat until sugar melts. Allow mixture to cool down. 3. Blend the mixture with 700ml of the chilled Lipton Pyramid Forest Fruit Tea. Add Yuzu paste to mixture and blend well. Keep in freezer. *Tip: -You can experiment and replace Yuzu paste with orange or grape jams for variety of flavours! - *EXCLUSIVELY* ALL COLD STORAGE OUTLETS in SINGAPORE! The Lipton team will also be at Cold Storage in the month of July to provide sampling trials to shoppers and to offer them an opportunity to experience for themselves the quality taste of Lipton Pyramid Tea! The translucent Pyramid tea bag is made of PET plastic, and is not biodegradable. You take a perfectly good biodegradable product and MAKE IT OUT OF PLASTIC!! I wouldn't be buying these again. however I will accept a big present like that if it ever landed on my doorstep....Lipton I'll only buy your tea bags if you send me one of those giant pink pyramids!!! SHuiYuki's Qoo10 Great Baragin - Time Sales! SHuiYuki's Awesome Find at Qoo10_Singapore!